Nowadays, having an online presence is very important for many businesses. Likewise, it is also becoming more and more important for people to have a personal blog or website on the internet. Blogs can help you connect with many people on the internet and form new connections. Gone are the days when social media used to dominate how people interacted with others online and dictated how people consume information. Now is the best time for you to start a blog and make your voice heard. By having a personal blog on the internet, you have opened up yourself to so many opportunities. In this post, I will teach you how to start a WordPress blog and get it running in no time. When you start blogging, you will learn a whole lot of things – it will help you improve your writing and communication skills, develop a regular writing habit and teach you other aspects of maintaining a successful blog like search engine optimization, keyword research, digital marketing, analytics, online advertising, etc. All these skills will help you transform yourself into a successful person online and in your workplace. 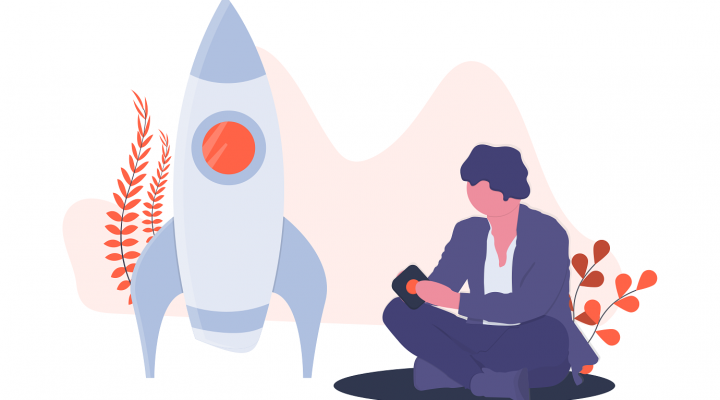 Content writers, SEO analysts, and digital marketers are in great demand now as businesses are realizing the importance of sharing really useful content on their website to generate potential leads. When it comes to starting a blog or website, WordPress is what comes to my mind. What is WordPress? WordPress was basically a content management system but nowadays, it has improved so much and it can be used to create awesome blogs and websites effortlessly. Creating your blog or website is a piece of cake with WordPress – keep reading this post and you’ll thank me later. What do you need for starting a blog? For creating your blog, you need two important things – a domain name and a web hosting plan. Your domain name is like your address on the internet (like google.com, antonyagnel.com, etc) and your web hosting plan gives you a server on the internet where you can host your website’s files. Someone needs to pay for the bandwidth, right? Bonus Read – 7 Reasons why you should use WordPress. Though WordPress can run effortlessly on any web server, it has got certain minimum requirements for it to run without a glitch. It is suggested that you choose a web host which is officially recommended by WordPress itself. Bluehost has been the recommended host for WordPress for more than ten years. This one point is enough to convince you to go with Bluehost as your blog hosting provider. Here are a few more reasons why you should go with Bluehost – Bluehost is highly reliable and offers very good customer support 24 hours a day, 7 days a week and their support staff are highly knowledgeable in WordPress. Moreover, Bluehost offers custom and easy to use hosting control panel. With Bluehost, you can install WordPress directly from your control panel in one click using their 1-Click WordPress installer. You can also add unlimited websites, email accounts, and domains to your account. Their pricing plans are also affordable by everyone. All their web hosting plans come with a 30-days money-back guarantee and an option to cancel your purchase anytime. To further sweeten this deal, if you sign-up through this post, you will be able to buy their basic shared web hosting package for just $3.95 per month and get a free domain name. Purchasing a web hosting plan from Bluehost isn’t too hard, just follow the below steps in order to set up your account in no time. You can complete the whole sign-up process faster than you can imagine if you’ve already got a domain name on your mind along with a credit card or PayPal account to pay for hosting. 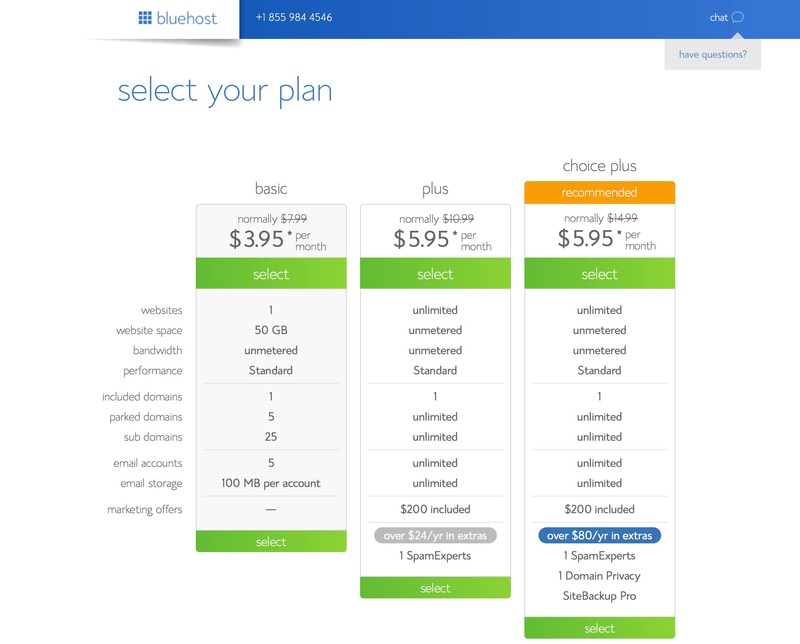 Step 1 – Go to Bluehost.com and click on the ‘get started now’ button. Step 2 – On the next screen, choose the plan which you feel is suitable for your site. Choose ‘Basic’ if you are just starting out with your site for the first time. If you already have a blog which is quite popular and you are migrating to Bluehost, choose either the ‘Plus’ or ‘Choice Plus’ plans. If it is for a business website, select the ‘Go Pro’ plan so that you can get a high-performance server with dedicated IP, domain privacy, SSL certificate, site backup, etc. Step 3 – Now, you need to choose a domain name for your site. If you want a new domain name, you can register it for free over here; or if you already have a domain name you can sign up with it and point its DNS records to Bluehost’s name servers. Important: Read how to choose the perfect domain name for your blog before you register a domain name. Step 4 – Once you have entered a domain name, click on the ‘next’ button. In the following screen, enter your details to fill in your account information. Once you have filled your account details, scroll down to find the package information. Now, choose the hosting package you need. Basic shared hosting is priced at 12, 24, 36 and 60-month terms respectively. To save money, choose a longer term plan as the price per month reduces when the term gets longer. When you choose a 36 or 60-month term, you can get hosting for as low as $3.95 per month. After purchasing your web hosting plan, if your blog goes viral or your site receives more than expected traffic from search engines, you can easily upgrade to the next big plan or upgrade to a VPS or dedicated hosting plan to accommodate the surge in traffic. There are also a few other value-added features which you can purchase if you don’t mind spending on your blog. These features include domain privacy protection (highly recommended), site backups (required), search engine jumpstart (not needed), SiteLock security (don’t go for it if not necessary), etc. I would recommend you to purchase ‘Domain Privacy Protection’ so that your domain registration details are kept private and no one can look up for your personal details online as it includes your personal email address, phone number, and residential address. Step 5 – After you have chosen your hosting package and additional features, scroll down to find the payment information form. Fill in the required details and authenticate your payment by clicking on the ‘submit’ button. Step 6 – After completing your purchase, choose a strong password for your account. A good password should have both capital and lowercase letters, a number, and a special character (? !#, etc.) in order to protect your account from brute force and dictionary attacks. Now that you have signed up, you can log into your account and get started with installing WordPress. Once you have logged into your Bluehost account, you can choose a theme for your blog or website. Don’t worry, you can change your theme anytime after that. I would recommend you to go with one of these three themes – Astra, GeneratePress or MTS Schema for the best performance. Once you have chosen the desired theme, you can log in to your WordPress site. After logging in, you will be greeted with Bluehost’s default WordPress Dashboard. Here, you can select what type of website you want to set up – whether you want to set up a personal blog or a business website. Many people think it is difficult and confusing to install and set up WordPress on their server, but it is quite simple actually as you have seen in the above steps. Bluehost offers its users access to MOJO Marketplace from where users can install applications such as WordPress in just one click. Clicking on the ‘Launch’ button fires up the WordPress configuration screen. On the next screen, enter your site title and site description. For example, ‘Antony Agnel’ is my site title and ‘WordPress | Blogging | Marketing | SEO’ is my site description. The site title is what people call your website and the site description is a tagline or short description of what your website is about. Keep it short and exciting. After entering the required information, click on the ‘Next Step’ button. Your WordPress site is now fully configured and your site’s admin page URL, username and password will be displayed. A copy of this information will be emailed to you as well. Note it down somewhere private where only you can access them. You can now log in to your site by clicking on the ‘Log into WordPress’ button and entering your username and password. Once you have logged in, you will be taken to your WordPress Dashboard from where you can get full control of your website. And hey, do not forget that if you sign up through this tutorial you will receive a special offer – shared hosting for just $3.95 per month and a free domain name! You might now be interested in installing the best WordPress plugins for your site. If you feel that the above steps are confusing for you or you just don’t want to go the complex steps involved in setting up a blog from A to Z, you can hire me to create a blog for you. Just drop me a line using the contact form on my blog and I would be happy to help you out. Already bought a domain name and hosting plan from somewhere else? No problem, I would still love to help. So, how was this easy ‘how to start a WordPress blog’ guide? Did you like it? Was it useful? Did it help you create your first blog on WordPress? I would love to hear about it in the comments! Hi. Susie said I should ask you for help. When I go to WP, it gives me a long blue screen, then my posts lined up to read with a search line on top. It won’t move from there. I can push all the buttons, edit, view, etc, doesn’t move. Been about a week of this. Any ideas? Hey there, I’m not sure I can understand your query properly. If you don’t mind, can you send me a screenshot of that to hello[at]antonyagnel.com? I’ll have a look at it and get back to you. Glad to hear that the issue is resolved now. For the website, it wasn’t actually 5 minutes. It was more like 5 weeks. I was transferring a blog to a website, and the transfer of domain name, etc. took a lot of time. The biggest problem for me was and still is choosing the theme, I tried at least 4 paid themes and it all looked nice until I realized that they were not what I wanted. So, I just stuck with twenty seventeen, and I don’t want to undo everything, therefore, it’s going to be like that for a while. I find that Bluehost was a wrong thing to choose, but I again do not want to go through all troubles again, but other than that I would not choose Bluehost if I was doing the same right now. WordPress blog is a great thing, therefore, I actually regret moving my art blog to a website. I still have a lifeschool blog, so, yes, WordPress blogs definitely work and they take 5 minutes to create. I believe it is good to either start a new website or a blog using WordPress platform, but transferring very large blog with extremely many images and links is a nightmare. Your post leads through all the necessary steps, it will certainly help somebody. I’d just add: think right right away whether you are fine with blog or you would rather have a website. It was intended so that I do not lose followers, etc., but I did to a big extent because as it appears WordPress Reader only makes visible new posts from blogs, not self-hosted websites. That is probably the biggest issue. Hey Inese, I can totally understand what you are trying to say. But this post is just for helping people to get started with their first blog/website, not on how to guide them to transfer it to another web host. Transferring a website from one host to another is always a headache, and that’s why I would like to introduce you to SiteGround. They allow you to request for a free website transfer to their hosting servers without any additional cost. Regarding WordPress themes, you have done the same mistake as other new website owners – premium themes do not always mean that they are ‘the best’. There are many other free themes available out there which perform even better than the premium/paid themes. 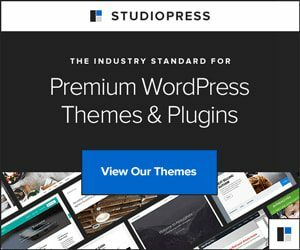 But if you would still insist on going for premium WordPress themes, I would suggest you go for Elegant Themes or StudioPress Genesis Framework. 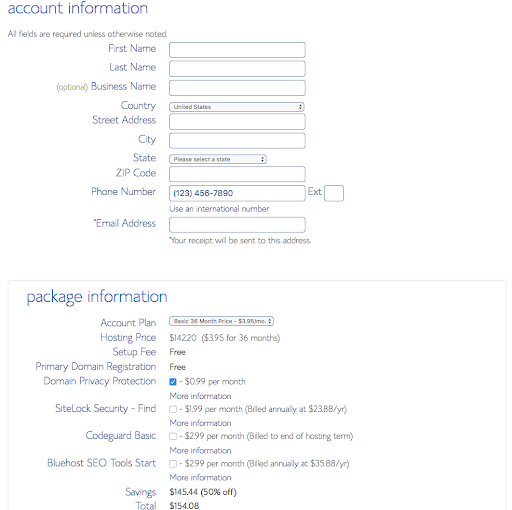 Coming back to web hosting, Bluehost is not bad at all for the price you pay for their web hosting services. They charge way lesser than many web hosting providers out there. Either you can upgrade to their premium plans or totally move out to a premium web host like Flywheel or Dreamhost. Now, that’s your choice. And yes, WordPress.com is always better for blogging but it isn’t enough if you need more control over your content and customization of your blog. Oh by the way, you can transfer your WordPress.com subscribers to your self-hosted blog using the Jetpack plugin for WordPress. Here’s a tutorial for that. Hope I have answered most of your questions. If you’ve got any other doubts or queries, feel free to reply to this comment or you can contact me using the contact form on my website. Hello! I nominated you for the sunshine blogger award.. please check it out (link removed). Hey Angel Lou, thank you for nominating me for the blogger award. It shows how much you value my content and I’m grateful for that. But unfortunately, I’m not into these blogger awards stuff, sorry. Great post with useful information to be applied practically! Hey Sweta, thanks for your comment. I’m glad that you found it useful! Thank you Neha, glad to hear that you found my version of ‘how to start a blog’ tutorial easy and simple to understand. It means so much.